National Dwelling Values Continue To Trend Lower, Falling By Half A Percent In October. The weakest conditions continue to be felt across Australia’s two largest cities where investment buyers have been the most concentrated, supply additions have been the highest and where housing affordability is the most stretched. Sydney values are down 7.4% over the past twelve months and Melbourne values are 4.7% lower over the same period. 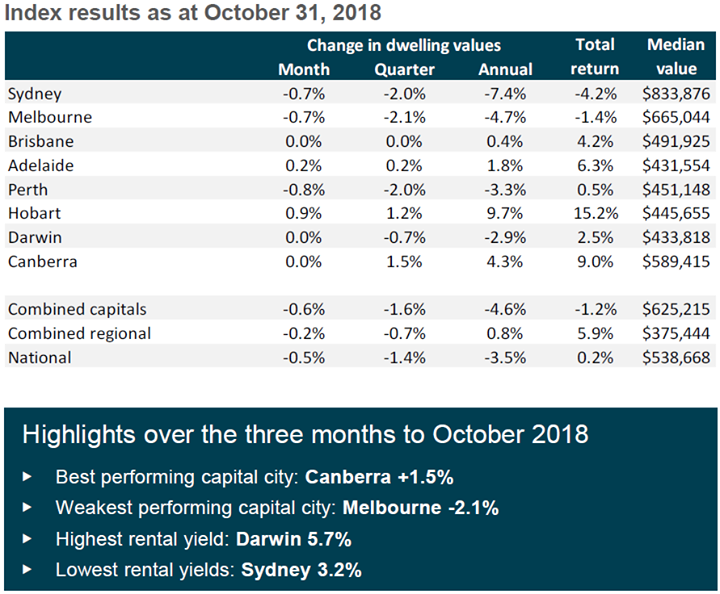 Values also declined in Perth and Darwin however, the downturn in these two cities has been ongoing since mid-2014, with values falling 3.3% and 2.9% respectively over the past twelve months. Although dwelling values are rising on an annual basis across the remaining cities, the pace of growth has eased. Gross rental yields are slowly recovering as dwelling values trend lower and rents edge higher, but remain well below their decade average of 4.31%. to take some time, considering national rents have remained relatively flat over the year to date and are only 0.8% higher over the past twelve months.